I have a couple of new posts up elsewhere: a brief one at Copyediting discussing those dialect maps that are making the rounds and asking whether Americans really talk that differently from each other, and a longer one at Visual Thesaurus (subscription required) discussing the role of copy editors in driving restrictive relative which out of use. Stay tuned, and I’ll try to have something new up here in the next few days. As I said in my last post, I don’t think the distribution of that and which is adequately explained by the restrictive/nonrestrictive distinction. It’s true that nearly all thats are restrictive (with a few rare exceptions), but it’s not true that all restrictive relative pronouns are thats and that all whiches are nonrestrictive, even when you follow the traditional rule. In some cases that is strictly forbidden, and in other cases it is disfavored to varying degrees. Something that linguistics has taught me is that when your rule is riddled with exceptions and wrinkles, it’s usually sign that you’ve missed something important in your analysis. In researching the topic for this post, I’ve learned a couple of things: (1) I don’t know syntax as well as I should, and (2) the behavior of relatives in English, particularly that, is far more complex than most editors or pop grammarians realize. First of all, there’s apparently been a century-long argument over whether that is even a relative pronoun or actually some sort of relativizing conjunction or particle. 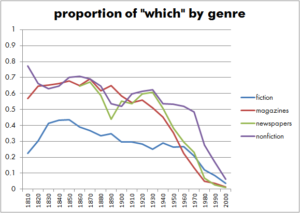 (Some linguists seem to prefer the latter, but I won’t wade too deep into that debate.) Previous studies have looked at multiple factors to explain the variation in relativizers, including the animacy of the referent, the distance between the pronoun and its referent, the semantic role of the relative clause, and the syntactic role of the referent. What is interesting is that that and the wh- relatives, who and which, occupy overlapping but different portions of the hierarchy. Who and which can relativize anything from subjects to possessors and possibly objects of comparative particles, though whose as the genitive form of which seems a little odd to some, and both sound odd if not outright ungrammatical with comparatives, as in The man than who I’m taller. But that can’t relativize objects of fronted prepositions or anything further down the scale. Strangely, though, there are things that that can do that who and which can’t. That can sometimes function as a sort of relative adverb, equivalent to the relative adverbs why, where, or when or to which with a preposition. That is, you can say The day that we met, The day when we met, or The day on which we met, but not The day which we met. And which can relativize whole clauses (though some sticklers consider this ungrammatical), while that cannot, as in This author uses restrictive “which,” which bothers me a lot. So what explains the differences between that and which or who? Well, as I mentioned above, some linguists consider that not a pronoun but a complementizer or conjunction (perhaps a highly pronominal one), making it more akin to the complementizer that, as in He said that relativizers were confusing. And some linguists have also proposed different syntactic structures for restrictive and nonrestrictive clauses, which could account for the limitation of that to restrictive clauses. 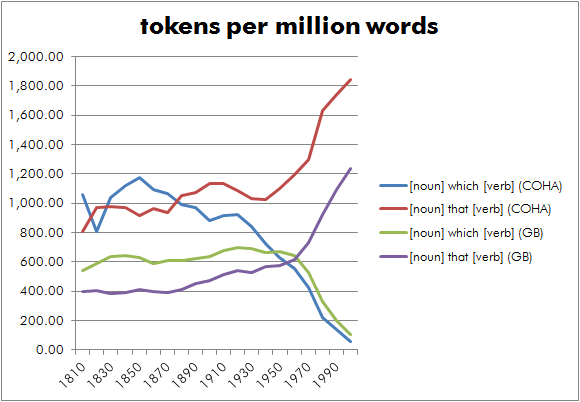 If that is not a true pronoun but a complementizer, then that could account for its strange distribution. It can’t appear in nonrestrictive clauses, because they require a full pronoun like which or who, and it can’t appear after prepositions, because those constructions similarly require a pronoun. But it can function as a relative adverb, which a regular relative pronoun can’t do. As I argued in my previous post, it seems that which and that do not occupy separate parts of a single paradigm but are part of two different paradigms that overlap. The differences between them can be characterized in a few different ways, but for some reason, grammarians have seized on the restrictive/nonrestrictive distinction and have written off the rest as idiosyncratic exceptions to the rule or as common errors (when they’ve addressed those points at all). The proposal to disallow which in restrictive relative clauses, except in the cases where that is ungrammatical—sometimes called Fowler’s rule, though that’s not entirely accurate—is based on the rather trivial observation that all thats are restrictive and that all nonrestrictives are which. It then assumes that the converse is true (or should be) and tries to force all restrictives to be that and all whiches to be nonrestrictive (except for all those pesky exceptions, of course). Garner calls Fowler’s rule “nothing short of brilliant,”1Garner’s Modern American Usage, 3rd ed., s.v. “that. A. And which.” but I must disagree. It’s based on a rather facile analysis followed by some terrible logical leaps. And insisting on following a rule based on bad linguistic analysis is not only not helpful to the reader, it’s a waste of editors’ time. As my last post shows, editors have obviously worked very hard to put the rule into practice, but this is not evidence of its utility, let alone its brilliance. But a linguistic analysis that could account for all of the various differences between the two systems of relativization in English? Now that just might be brilliant. I meant to blog about this several weeks ago, when the topic came up in my corpus linguistics class from Mark Davies, but I didn’t have time then. And I know the that/which distinction has been done to death, but I thought this was an interesting look at the issue that I hadn’t seen before. For one of our projects in the corpus class, we were instructed to choose a prescriptive rule and then examine it using corpus data, determining whether the rule was followed in actual usage and whether it varied over time, among genres, or between the American and British dialects. One of my classmates (and former coworkers) chose the that/which rule for her project, and I found the results enlightening. She searched for the sequences “[noun] that [verb]” and “[noun] which [verb],” which aren’t perfect—they obviously won’t find every relative clause, and they’ll pull in a few non-relatives—but the results serve as a rough measurement of their relative frequencies. What she found is that before about the 1920s, the two were used with nearly equal frequency. That is, the distinction did not exist. After that, though, which takes a dive and that surges. 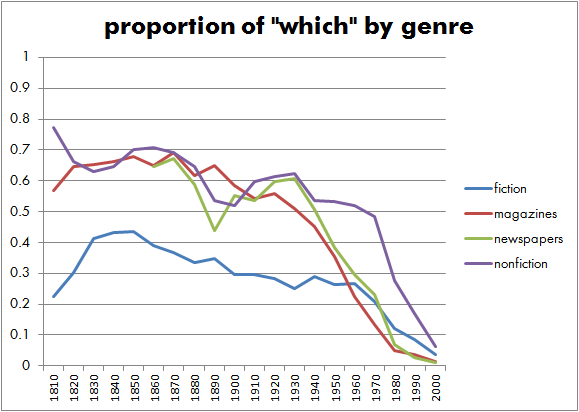 The following chart shows the trends according to Mark Davies’ Corpus of Historical American English and his Google Books N-grams interface. The strange thing about this rule is that so many people not only take it so seriously but slander those who disagree, as I mentioned in this post. Bryan Garner, for instance, solemnly declares—without any evidence at all—that those who don’t follow the rule “probably don’t write very well,” while those who follow it “just might.”1Garner’s Modern American Usage, 3rd ed., s.v. “that. A. And which.” (This elicited an enormous eye roll from me.) But Garner later tacitly acknowledges that the rule is an invention—not by the Fowler brothers, as some claim, but by earlier grammarians. If the rule did not exist two hundred years ago and was not consistently enforced until the 1920s or later, how did anyone before that time ever manage to write well? Something that linguistics has taught me is that when your rule is riddled with exceptions and wrinkles, it’s usually a sign that you’ve missed something important in its formulation. I’ll explain what I think is going on with that and which in a later post. I’m not just talking about that and which but also who, whom, and whose, which is technically a relative possessive adjective. Judging by how often relative pronouns are talked about, you’d assume that most English speakers can’t get them right, even though they’re among the most common words in the language. In fact, in my own research for my thesis, I’ve found that they’re among the most frequent corrections made by copy editors. So what gives? Why are they so hard for English speakers to get right? The distinctions are pretty clear-cut and can be found in a great many usage and writing handbooks. Some commentators even judgementally declare, “There’s a useful distinction here, and it’s lazy or perverse to pretend otherwise.” But is it really useful, and is it really lazy and perverse to disagree? Or is it perverse to try to inflict a bunch of arbitrary distinctions on speakers and writers? Simple, right? To make it all a little clear, I’ve even put it into a nice little table. This is, in a nutshell, a very lopsided and unusual system. In a comment on my who/that post, Elaine Chaika says, “No natural grammar rule would work that way. Ever.” I’m not entirely convinced of that, because languages can be surprising in the unusual distinctions they make, but I agree that it is at the least typologically unusual. “But we have to have rules!” you say. “If we don’t, we’ll have confusion!” But we do have rules—just not the ones that are proposed and promoted. The system we really have, in absence of the prescriptions, is basically a distinction between animate who and inanimate which with that overlaying the two. Which doesn’t make distinctions by case, but who(m) does, though this distinction is moribund and has probably only been kept alive by the efforts of schoolteachers and editors. Whom is still pretty much required when it immediately follows a preposition, but not when the preposition is stranded. 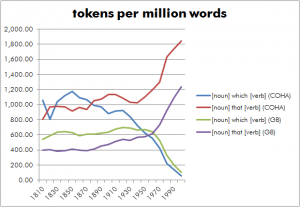 Since preposition stranding is extremely common in speech and increasingly common in writing, we’re seeing less and less of whom in this position. Whose is still a little iffy with inanimate referents, as in The house whose roof blew off, but many people say this is alright. Others prefer of which, though this can be awkward: The house the roof of which blew off. One explanation for this might be that as speakers make the choices that will result in standardisation, they unconsciously tend towards more complex structures, because of their sense of the prestige and difference of formal written language. Standard English would then become a ‘deliberately’ difficult language, constructed, albeit unconsciously, from elements that go against linguistic naturalness, and which would not survive in a ‘natural’ linguistic environment.1“Rats, Bats, Sparrows and Dogs: Biology, Linguistics and the Nature of Standard English,” in The Development of Standard English, 1300–1800, ed. Laura Wright (Cambridge: University of Cambridge Press, 2000), 53. It’s always tricky territory when you speculate on people’s unconscious motivations, but I think he’s on to something. Note that while the prescriptions make for a very asymmetrical system, the system that people naturally use is moving towards a very tidy and symmetrical distribution, though there are still a couple of wrinkles that are being worked out. But the important point is that people already follow rules—just not the ones that some prescriptivists think they should. 1. ↑ “Rats, Bats, Sparrows and Dogs: Biology, Linguistics and the Nature of Standard English,” in The Development of Standard English, 1300–1800, ed. Laura Wright (Cambridge: University of Cambridge Press, 2000), 53. A couple of weeks ago the venerable John E. McIntyre blogged about a familiar prescriptive bugbear, the question of that versus who(m). It all started on the blog of the Society for the Promotion of Good Grammar, where a Professor Jacoby, a college English professor, wrote in to share his justification for the rule, which is that you should avoid using that which human referents because it depersonalizes them. He calls this justification “quite profound,” which is probably a good sign that it’s not. Mr. McIntyre, ever the reasonable fellow, tried to inject some facts into the conversation, but apparently to no avail. What I find most interesting about the whole discussion, however, is not the argument over whether that can be used with human referents, but what the whole argument says about prescriptivism and the way we talk about language and rules. (Indeed, the subject has already been covered very well by Gabe Doyle at Motivated Grammar, who made some interesting discoveries about relative pronoun usage that may indicate some cognitive motivation.) Typically, the person putting forth the rule assumes a priori that the rule is valid, and thereafter it seems that no amount of evidence or argument can change their mind. The entire discussion at the SPOGG blog proceeds without any real attempts to address Mr. McIntyre’s points, and it ends with the SPOGG correspondent who originally kicked off the discussion sullenly taking his football and going home. Indeed all prescriptive arguments about correctness that depend on intra-linguistic factors are post-hoc rationalizations. . . . But an intra-linguistic rationalization is not the reason why some usages are believed to be wrong. The reason is that it is simply common sense: everybody knows it, it is part of the culture to know it, and you are an outsider if you think otherwise: you are not a participant in the common culture, and so your views can be dismissed. To this extent, linguists who state that I seen it is not ungrammatical are placing themselves outside the common culture.1James Milroy, “Language Ideologies and the Consequences of Standardization,” Journal of Sociolinguistics 5, no. 4 (November 2001), 536. Our society has a tendency to depersonalize people. Using that as a relative pronoun with human referents depersonalizes them. There are probably more, but that covers the bases. Note that even if we agree that our society depersonalizes people and that this is a bad thing, it’s still quite a leap from this to the claim that that depersonalizes people. But, as Milroy argued, it’s not really about the justification. It’s about having a justification. You can go on until you’re blue in the face about the history of English relative pronoun usage (for instance, that demonstrative pronouns like that were the only option in Old English, and that this has changed several times over the last millennium and a half, and that it’s only recently that people have begun to claim that that with people is wrong) or about usage in other, related languages (such as German, which uses demonstrative pronouns as relative pronouns), but it won’t make any difference; at best, the person arguing for the rule will superficially soften their stance and make some bad analogies to fashion or ethics, saying that while it might not be a rule, it’s still a good guideline, especially for novices. After all, novices need rules that are more black and white—they need to use training wheels for a while before they can ride unaided. Too bad we also never stop to ask whether we’re actually providing novices with training wheels or just putting sticks in their spokes. So if most prescriptions are based on unexamined assumptions and post hoc rationalizations, where does that leave things? Do we throw it all out because it’s a charade? That seems rather extreme. There will always be rules, because that’s simply the nature of people. The question is, how do we establish which rules are valid, and how do we teach this to students and practice it as writers and editors? Honestly, I don’t know, but I know that it involves real research and a willingness to critically evaluate not only the rules but also the assumptions that underlie them. We have to stop having a knee-jerk reaction against linguistic methods and allow them to inform our understanding. And linguists need to learn that rules are not inherently bad. Indeed, as John Algeo put it, “The problem is not that some of us have prescribed (we have all done so and continue to do so in one way or another); the trouble is that some of us have prescribed such nonsense.”2“Linguistic Marys, Linguistic Marthas: The Scope of Language Study,” College English 31, no. 3 (December 1969): 276. 1. ↑ James Milroy, “Language Ideologies and the Consequences of Standardization,” Journal of Sociolinguistics 5, no. 4 (November 2001), 536. 2. ↑ “Linguistic Marys, Linguistic Marthas: The Scope of Language Study,” College English 31, no. 3 (December 1969): 276.